Junior Golfers 18 & under – $ 12.00 green fee 7 days a week. Neshanic Valley Golf Course presents both novice through experienced players with a unique opportunity to improve their game on the 9-hole Academy Course. Tees and fairways are a mix of bluegrass and fescue, and greens are Penncross creeping bentgrass. The Executive-style layout offers a challenging par 32 track that plays 1,420 yards, 1,712 yards, and 2,019 yards, with three tees on each hole. With five par fours and four par threes, 19 sand traps, and a water hazard that can come into play on three holes, the Academy Course provides a similar experience to a regulation course. Golfers will be able to use every club in their bag, the longest hole measuring 323 yards. The layout is perfect for work on mid-iron approach shots, with five holes having driving distance exceeding 199 yards. 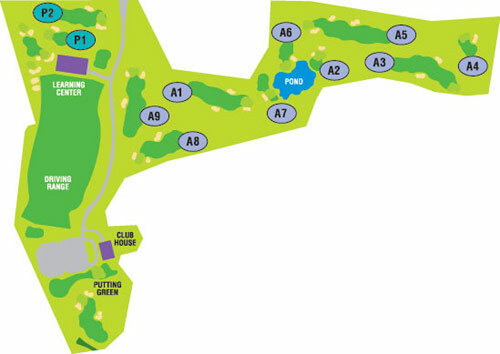 The par three holes measure from 63 yards to 166 yards, providing a perfect opportunity to work on the short game. The Academy Course is perfect for walking, and is well suited for a quick round. Electric golf carts are available.